Have you heard of someone having conjunctivitis? Have you heard of someone having pink eye? Did you know that they’re the same thing? Conjunctivitis (also known as pink eye) is a common condition involving the eye. Even though it might look a bit scary, it’s usually not serious. Read on for more information. Pinkeye is the term that people generally use to describe a common medical condition called “conjunctivitis.” Conjunctivitis is the inflammation (swelling) of the conjunctiva, which is a thin membrane that lines the inner part of the eyelids and the white part of the eyes. 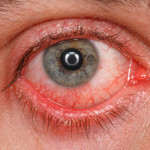 Conjunctivitis can either be infectious (caused by bacteria or a virus), or noninfectious (caused by an allergy or something else, such as chlorine from a swimming pool). If you have infectious pink eye caused by bacteria, the liquid that comes out of your eye will often be thick (almost like pus). If you have infectious pink eye caused by a virus, the liquid is often watery. For noninfectious allergic conjunctivitis, the liquid will usually be watery and itchy. Noninfectious conjunctivitis isn’t contagious, but infectious pink eye is extremely contagious. You can catch this type of pink eye by touching anything that has come in contact with an infected person’s eye. For example, if someone with infectious pink eye touches his/her eye and touches a doorknob, you can pick up the infection by touching the doorknob and then touching your eye(s). When should I call or see a health care provider? It’s a good idea to call or make an appointment with your health care provider if you have eye redness, pain, or discharge. He/or she will likely be able to tell if you have pink eye. Make sure to tell your health care provider about all of your symptoms and if anyone you know (classmate, friend, partner, or family) has recently been diagnosed with pink eye. The treatment for pink eye depends on whether it’s infectious or noninfectious. If you have noninfectious conjunctivitis, your health care provider will likely advise you to use eye drops (the same kind used to treat allergies). These are available at most pharmacies without a prescription. If you have infectious bacterial conjunctivitis, your health care provider will give you a prescription for antibiotic eye drops or ointment. Make sure to follow the instructions on the label on how often and how long you should use them – even if you’re feeling better. If you stop the treatment too soon, the infection could come back. If you don’t feel better or notice that your symptoms have not improved in a couple of days, be sure to call or make an appointment with your provider. If I have pink eye, is there anything else I can do to feel better? Yes. If you have pink eye, applying a warm compress (a clean cloth soaked in warm water) to your closed eye(s) may help soothe the discomfort. What can I do to prevent getting pink eye?